What can we do to increase our productivity while also saving on operating costs? This is the question many companies ask themselves. 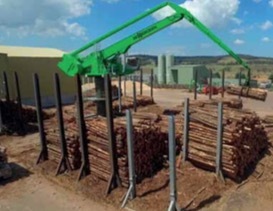 For John Borg, owner of Australia's Borg Manufacturing, the SENNEBOGEN was able to deliver a persuasive solution for wood handling with the 8130 equilibrium handler. Borg Manufacturing operates a large MDF factory in Oberon, a small town in New South Wales, Australia, that is about 2.5 hours West of Sydney. Since its founding in 1991, the family-owned business has become Australia's leading manufacturer of kitchen cabinet doors and decorative MDF panels distributed through the brand Polytec. The wide range of MDF panels are manufactured primarily at the Oberon site. This is where the new SENNEBOGEN handling machine comes into play. The SENNEBOGEN 8130 is the heart of the reorganized lumberyard. Whereas previously the conveyor belts of the loading system would be laboriously served by multiple vehicles using a ramp, these logistics are now covered by one stationary crane. The raw material, which can be between four and five metres in length, is unloaded and sorted all around the stationary balance crane. With its reach of 23 metres, the 8130 can easily cover an operating area of around 1,600m2. The reorganization added logistical value and also enhanced occupational health and safety, since only one central machine now does all of the loading. The loading line can now be safely filled from above, and vehicle traffic has been reduced. Operating and maintenance costs have also been reduced, reported Borg. “Where numerous vehicles were consuming a lot of expensive diesel before, the electric equilibrium handler now only accounts for a fraction of the costs.” The excessive ground wear from the vehicles is also a thing of the past. These vehicles would not only damage the surface when retrieving wood at ground level and result in yearly repairs, they would also introduce foreign material to the loading lines. This is now completely avoided thanks to the elevated machine position and grabbing from above. Australian sales and service partner Pacific Materials Handling delivered the 8130 in the middle of 2014. The machine is equipped with a 132kW electric motor, a 23m, and the Maxcab Industry cab. The crane is mounted above the loading line on a 5.5m-tall pylon. The equilibrium principle keeps the machine balanced thanks to a coupled counterweight. Only two hydraulic cylinders are needed to move the entire equipment.The electric drive proves itself with its strong performance and low noise level. In total, the longer maintenance intervals, small number of moving parts and the electric drive save up to 75% on operating costs — an argument that has persuaded not only Borg.